How did they persuade them to let them off? The original HMRC estimate of the tax Vodafone owed was about £6bn, after various tax evasion routes undertaken by the company over a number of years. Vodafone put aside £2bn ish, but in the end were only asked to pay £1.25bn - and they're paying that in installments. Osborne took the HMRC team who had been working on it off the Vodafone case and put a new team on it who were more "business-friendly". Vodafone in turn hired one of the HMRC employees who had been working the case to be their advocate instead. One theory is that the govt are in the pockets of big businesses - they've been bought out, or are scared that they'll relocate, or corporations and govt are simply run by many of the same rich and powerful people and their personal interests get in the way of their democratic responsibilities. A recent survey of 390 entrepreneurs carried out by RSM Tenon found that nine in ten entrepreneurs want additional resources to be put into combating tax evasion, and almost half (46%) want HMRC to enter into more agreements with overseas jurisdictions aimed at reducing offshore tax evasion. > Osborne took the HMRC team who had been working on it off the Vodafone case and put a new team on it who were more "business-friendly"
I didn't know that bit. Thanks. ``Business-friendly'' seems to be the coalition's motto. Thanks for the post: great account of the day, and gratifying to see the amount of support. The level of support was totally unexpected, and really made me think that this is a campaign that might actually work. 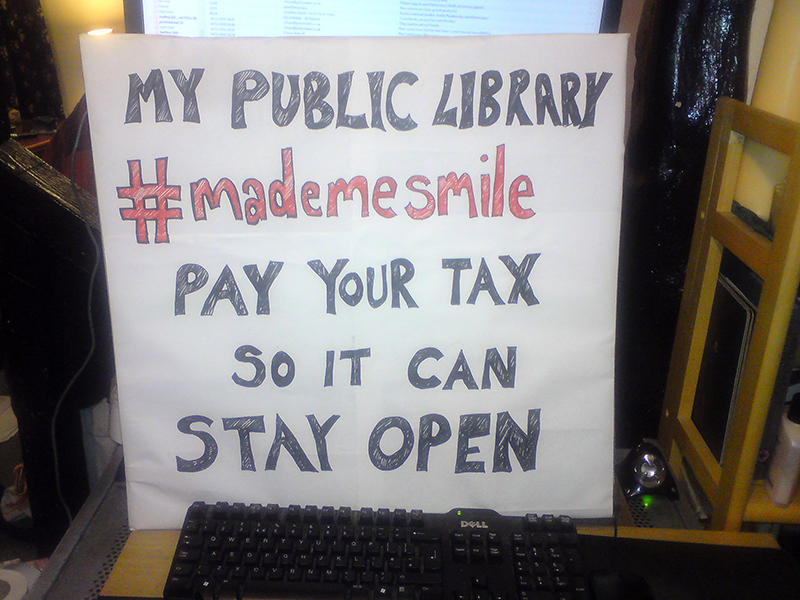 As a member of the Voices for the Library campaign, can I just say thank you for supporting public libraries. Libraries up and down the country are under threat and they need all the support they can get. Search for us on Facebook and show your support. Our website has a page to pledge support which is growing every day. Please add your name to show your support. We also have a Flickr group and would love your images to be shared there as well. Libraries are under threat....but we can still save them. Being bad for business is probably more effective than any number of confrontations in Parliament Square: propaganda images of stone-throwers - no matter how peaceful the protest - and of children being baton-charged will earn the Home Secretary a standing ovation at the party conference. It's an opportunity to talk tough and crack down on hate-figures paraded by the Daily Mail and, increasingly, the Telegraph. ...But disrupting trading at Arcadia and Vodaphone? Those companies *matter*. You can be certain that Cameron is meeting major party donors face-to-face today to reassure them that it'll all be smoothed over. The immediate effects of these meetings will, of course, be negative - expect surveillance and intimidation - but you can be certain that your voices are being heard. Next target? I would suggest that you expose and attack the conduits by which tax-evaders exert undue influence within the political parties. You can and should succeed in overcoming the PR barrage, and alienate the parties' paymasters from the public; but this is futile if the only 'public backlash' is an election which returns another bunch of deadbeats who do nothing about tax compliance and define success in terms of lucrative directorships. I have a theory that part of the reason is that the Newcastle protest was somewhat student-heavy. What was the demographic in London? The whole "get a job" / "they look like they've never paid tax in their lives" thing is a bit unavoidable - mostly because of prejudice, but partly because, let's face it, if you're dressing to spend 4 hours standing still in the freezing cold you're going to be wearing daft woolly hats and warm clothes and not care what you look like. I didn't join in any of the other protests going on in London, but very few people at the protest I was at were young enough to be students. I'd say it was over half lefties in their twenties/thirties, 1/4 librarians of all ages, and a few older people and pensioners. I'm so proud of you all. Wish I could have been there, but I'm pretty sure there are going to be a LOT more UK Uncut actions happening soon, so I imagine I'll be able to make some others!